Todays social ride was quite a ripper. We ( 4 ) departed around 10:00am from Woodend Station and after the ascent of Ashbourne Rd. caught up to Greg. From here it was a bit of climbing to Trentham for coffee where we said goodbye to Davo. From here we rode to Springhill (undulating) and then down to Coliban Reservoir where we took a photo. From here it was a bit of a haul home….but we did it! 76kms! 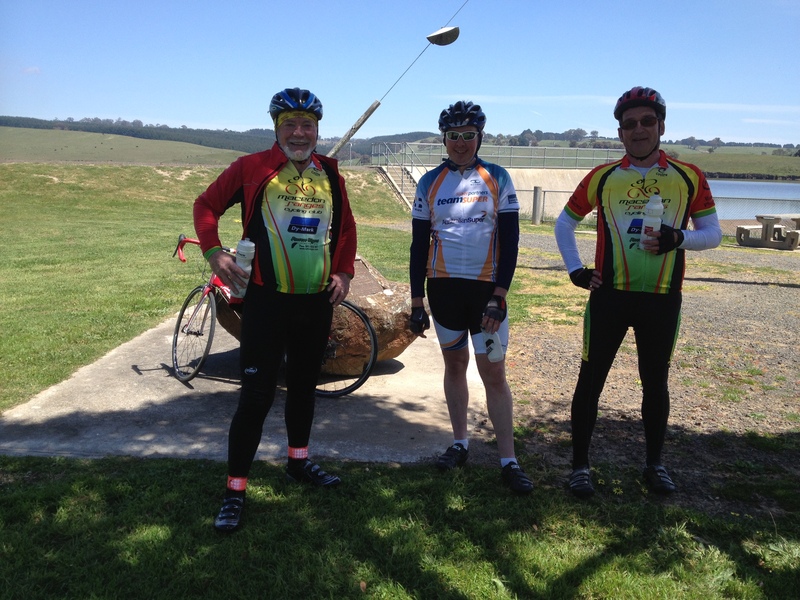 If you are interested in a social ride from Woodend – Trentham – Springhill – Kyneton – Woodend (about 70kms rated Medium) this weekend, we will be meeting at Woodend Railway Station at 9:30 am. Sunday 28th October. Bring yourself, bike and money for coffee. Note that you can deviate from this route at any stage if you find the distance/difficulty too onerous. The club championship scheduled for this weekend has bee postponed as was the ITT last weekend due to our commissaire being unavailable. It is anticipated that our ITT will be held on the 27th Oct and the club Championship on the 3rd Nov.. These dated will be confirmed closer to the time. Advanced notice. On Saturday 10th November it is anticipated that the Roll on – off area will be concreted at long last. So Come one Come all. Start time 7.00am ladies/children are most welcome as other work can be done. One of the most important things is something to BBQ when we are finished and BYO drinks. Could well be that we will need sustenance half way through the job so better bring smoko as well. With this in mind, the decision was that the club will welcome members of Bicycle Network Victoria as full club members. Our club handbook and constitution will be amended in the near future. When it is, all members will receive a copy of our amended club handbook while the constitution will be published on our website with hard copies available for committee members. It is anticipated sometime in the new year as the Vic Gov has changed the way that Incorporated clubs are to operate so we will need to see what is required before the changes are made. That’s it look forward to riding with you on the road in our club kit.